Traveling, for a large part of the population, has become a dance between airports and freeways leading to big cities and large draw historic sites. One of the reasons for this is the lack of real "vacation" time or "PTO" making these easy to reach places with endless activity a no brainer when time is a crunch. As well as the easy access for larger places, a lack of advertising revenue and a carnival style barker shouting at the top of their lungs has taken some of the most historic small towns in the US off of the big travel map. Well, I would like to put my resume in as carnival barker for a small town in Northwest Missouri. 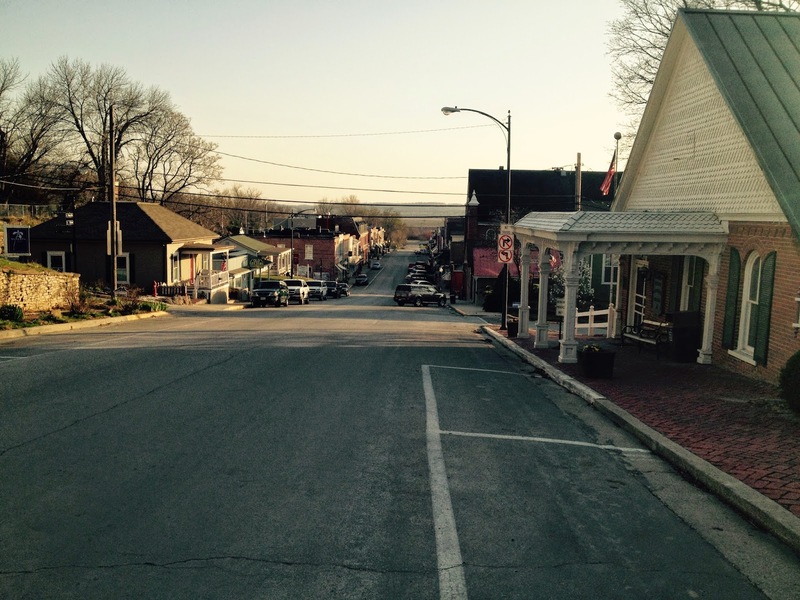 The town is Weston, Missouri. Weston can go toe to toe (in the historic and charming categories) with any place that I've been to in a long time. When you're in Weston, not only can you fill up your vacation time, but you can also fill up your glass with some great local beverages. Before I dive into a few round of local brews, let's take a look at the history of Weston itself. Like I said, Weston can go toe to toe with many places big and small (impressive for a city of only 1600 people). At Weston's pinnacle in the mid 1800's, it's population hovered around 5000 (which at the time was larger than Kansas City and nearby St Joseph). People made their way to this area because of the expedition led by Lewis and Clark. Their tales of fertile land and an abundance of animals for the fur trade started the boom. Weston flourished throughout the late 1800's as the second largest port on the Missouri River. The town housed a brewery and a distillery throughout the 1800's, as many booming towns did pre-prohibition. Buffalo Bill Cody was resident of Weston. Weston was also the largest cultivator of hemp west of the Mississippi until the prohibition of marijuana in the early 1900's. After hemp was outlawed, Weston became one of the largest tobacco growing areas, again west of the Mississippi. All of that history and more (including the history of the slave trade and effects of the Civil War on the area) make Weston a historians dream town. When you put that together with the fact that the aesthetic's of the town have been preserved by adding many of the buildings to the National Historic Register, Weston becomes a dream for any traveler looking for laid back days and great local culture. Weston also has you covered when it comes to adult beverages. With a winery, distillery, and brewery all operational today, Weston is what I consider the model of a throwback small town that every town should aspire to be. Local restaurants, local lodging, local alcohol, and local hospitality combine for an economic powerhouse for small town America with flavors that reflect the spirit of Weston. My trip to Weston centered around the town's brewery, the Weston Brewing Company (which is great because now I have more excuses to go back to the distillery and the winery). The brewery itself was founded in 1842. Like the rest of the town, the brewery has quite the history. A fire destroyed the original brewery in the 1860's, operations were on again off again after it was rebuilt due to financial constraints, and then after Kansas prohibition laws were passed in the 1880's the brewery was taken over by a Kansas brewer. After a tumultuous 40 years the brewery took off producing 20,000 barrels per year and actually being the sponsor for the first Kansas City Royals baseball team. The royal lager, or Weston Royal, had a falling throughout the Midwest in the early 1900's and was dubbed "the beer that made Milwaukee jealous". After the failed prohibition experiment, the brewery laid inactive until a short run in the 90's. Awesome stone cellars, reminded me of a Czech Brewery tour we've taken in the past. 10 years ago the operation was fired up again and has been going strong ever since. Weston Brewery is unique. The brewery has 2 buildings (a restaurant and tap room/bar) that are all connected by underground tunnels and cellars. The cellars themselves are original and were dug for lager fermentation. Outside is a great patio and beer garden as well. Honest to goodness this brewery is an absolute gem before you even try a sip of beer. I'm not trying to be an over dramatic idiot when I say this, but you could really picture people in the underground cellars and bar enjoying a cold lager 100 years ago. I even roll my eyes when I type that, but when you go you'll see. Cream Ale outside in March...yes please! I obviously sampled all of them and (like many of our small town brewing friends) enjoyed every drop. There is something special about beer brewed in less than mass production, but when we walk into the breweries that support towns off the beaten path the beer seems to have an extra smoothness to it. Weston Brewery fit that same bill, and with the added history and uniqueness of the brewery itself, I immediately fell in love with this place. My favorite brew was the cream ale. The night I was at the brewery was a perfect 75 degree Midwestern spring evening without a hint of a breeze. The cream ale's smooth finish without any over the top bitterness was absolutely perfect for the weather that night. It was truly a great beer and if you can find it outside of making a trek to the brewery, I suggest you pick some up (but you need to go to the brewery too). Of course I hit some KC BBQ after the brewery, how did my beard hold up though...wait what? The Kansas City area (which Weston is a stone's throw from) is one of my favorite places for food and beer in America. I wish I could have KC BBQ stuck in my beard every day (that's just gross, the beard part). KC has made huge strides over the last 15 years to position itself as one of the hot spots for tech jobs and young talented professionals. That means a lot of people moving to and visiting the area, and to those of you living in the area or traveling to this hot spot on the plains I implore you to take the short drive up the river to Weston. You'll love the history, and the beer is perfect for washing the sauce out of your beard (still gross)!